A selfie is something new and modern. Love is something ancient and eternal. When I took this picture, I had a specific concept in mind. In reviewing the picture, it has many more layers and event deeper meaning to it than I had thought it would. 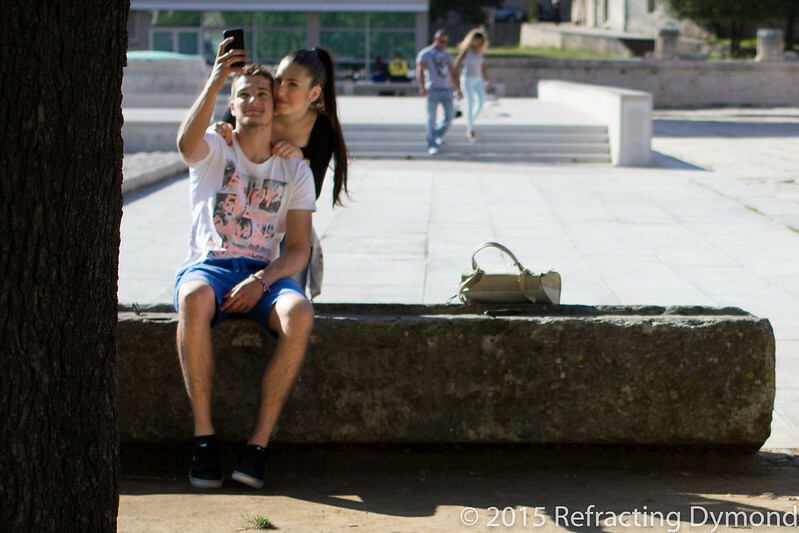 It was taken in Zadar at the Forum, which is an open space around Roman ruins. It was a beautiful day, with a nice breeze blowing from the water. I was rather close to this couple and immediately pointed the camera at them to get this. I didn’t have time to move to a better shot. Because the tree is in the way and the focus is on the tree. This initially angered me, but once I viewed the picture large, I felt it gives the picture a much more voyeuristic feeling than it actually was live. The selfie couple exudes genuine happiness. In the background and even more blurry, another couple walks hand-in-hand behind them. Layers of love, modern technology and old fashioned hand-holding. The modern technology – me with my camera and the couple with their cell phone – at this ancient forum. I love the complexity and layers of this image.